Tonight members of the Victoria Guest Services Network had the opportunity to tour the Bay Centre in the heart of downtown Victoria on famed Government Street. This is truly a classic shopping centre with something for everyone. There is something new to discover on each and every visit. Improvements are underway right now to bring new and better stores, creating a wonder of choice for the shopper. Our tour refreshed our memories about all the services available to tourists. Anything missed from the packing list can be found, as well as souvenirs and unique gifts. The Bay Centre features a mix of over 90 street front and interior shops where you'll find name brands, tasty dining options and exceptional service in an urban shopping environment. There is a bright and cheery food court on the 4th floor with a beautiful outdoor patio. At the other end of the building you can have a reasonably priced meal with a great view of the Inner Harbour at Café Bon Appetit on Level 5 of Hudson's Bay. There are another half dozen places to eat on the perimeter of the Centre, including Earl's, one of the finer casual restaurants in Victoria. 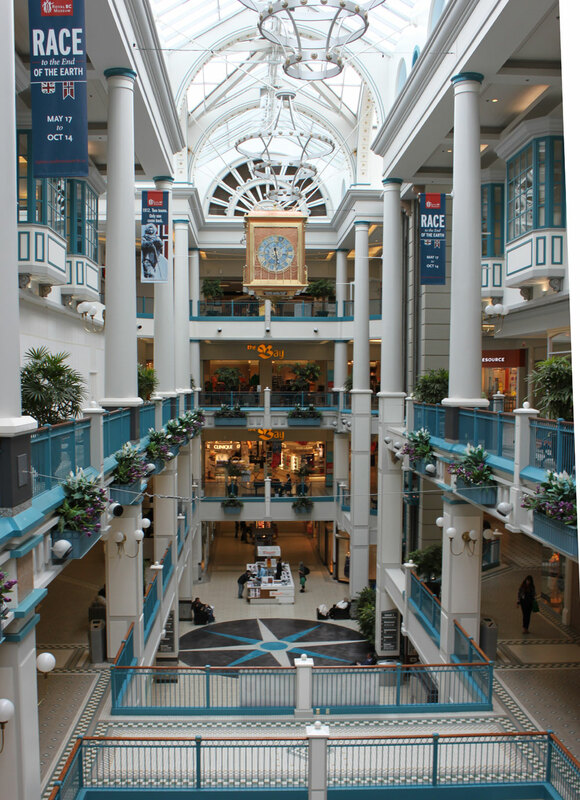 Just to give you an idea of what you might find in the Centre, here are some of the stores we passed: Aerosoles, BCBGMAXAZRIA, Club Monaco, Eco Chic Aveda Salon & Spa, Call It Spring, Guess?, JACOB, Crabtree and Evelyn, L'Occitane, Melanie Lyne, My Foot Reflexology, Sport Chek, Hudson's Bay, Tuscan Kitchen, Purdy's, Marble Slab Creamery, Smart Set, Quiksilver and many more. So if you live in Victoria, come back to the Bay Centre soon and find out what you are missing. There is convenient parking in the lower level and you can now even charge your electric car at one of the new charging stations in the parking area. Come and find out what 7 million visitors see each year. Following our tour, we were invited to Earl's for refreshing mint and lemon infused water and a selection of delicious appetizers. Thanks Earl's, it was great as always. For more pictures of this tour, please go to the VGSN facebook page.